UCO Duravent is an autoclaved cellulose fibre cement slotted eave lining board, creamy white in colour. It is an asbestos free board with pre-engineered slotted vents. Easy to install with minimum wastage. 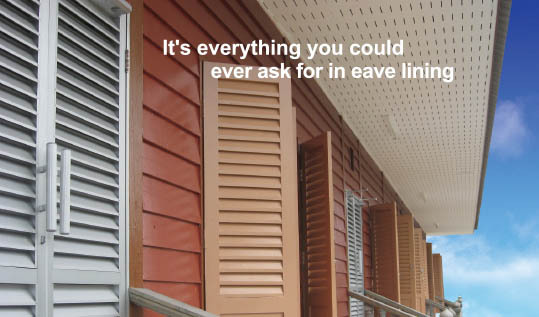 Slotted eave sheets are functional, simple to work with and easily installed. They are tough yet flexible and can be fixed in a number of ways. Nail fix UCO Duravent 3.2mmx610mm x 1220mm onto pressure treated grade ‘B’ timber ceiling joists with noggings at 610mm centres, using 75mm x 38mm wall plate at wall junction and 38mm x 12mm beading with rounded edges at sloping roof eaves. Height not exceeding 3.5m.